While backtesting the trend line from the Mar '09 lows, the market did a little throw-over last week -- exceeding the resistance by 14 points on Thursday, but giving it all back on Friday. As we discussed in Confidence Fairies and Snowballs, this throw-over was a function of the government's attempt to intervene in the oil markets. While doing little to contain energy prices, the move threw a monkey wrench into the bulls advance, meaning the market went father and faster than it otherwise would have. 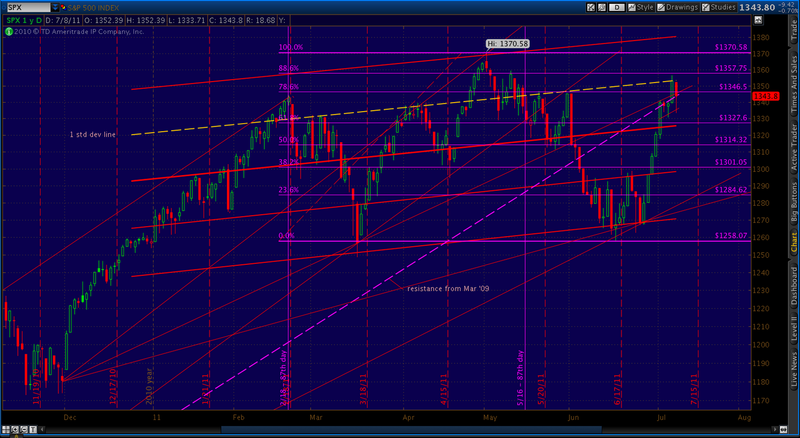 A quick look at the big picture, showing the trend line going back three years to the Mar '09 lows. While it's entirely possible that the market is gathering momentum for another move higher, I don't believe we'll exceed May's high of 1370. 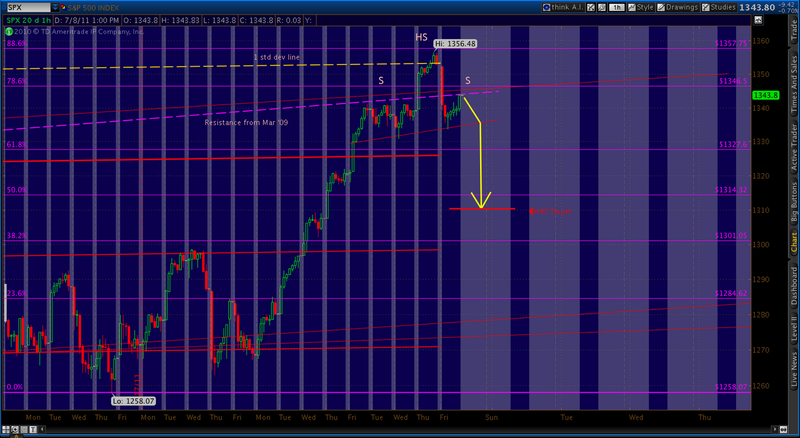 A quick look at the 60-minute version of the above chart illustrates where we are relative to resistance. As mentioned above, there was a throw-over on Thursday. As shown above, the advance was stopped dead in its tracks by the one-standard deviation line of the regression channel that's defined this top. Friday we quickly and forcefully reversed back below that line. 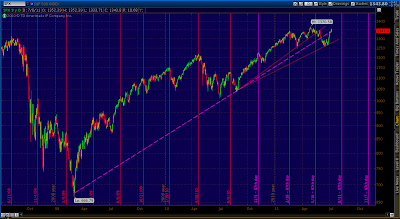 Friday's slide ultimately lost steam, but the move back up was halted by the above-mentioned trend line. (7) the 87-day pattern coming up. If we can eek out another 10 points to the downside, we will have completed a little head and shoulders pattern that should take us back to 1310. That's a decline of 33 points from Friday's close. It should be enough to kick start the next wave down. 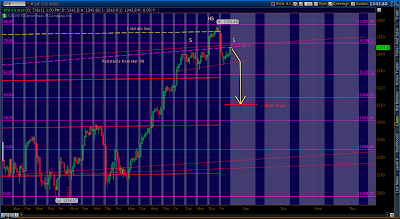 If we complete the H&S pattern setting up since the first of the year, we're going much lower. I've also been studying breadth, looking for comparisons to the 2007 top that, so far, is serving as a blueprint for this market. 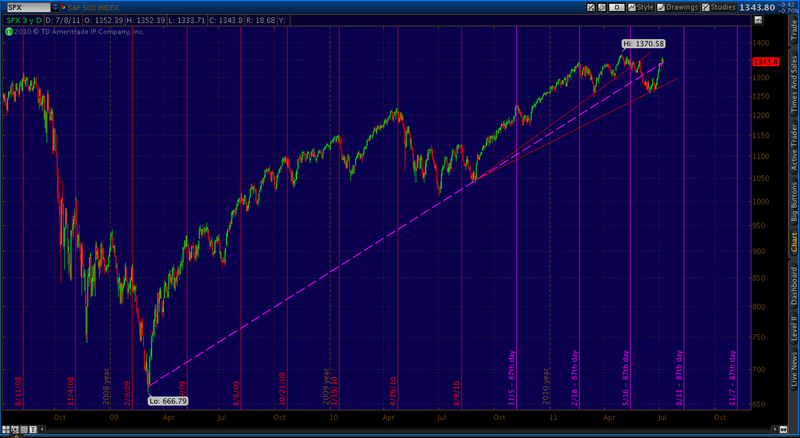 Take a look at the following chart. Focus on the bottom study, the McClellan Oscillator -- derived from the 19 and 39-day exponential moving averages of the daily difference between Advances and Declines. 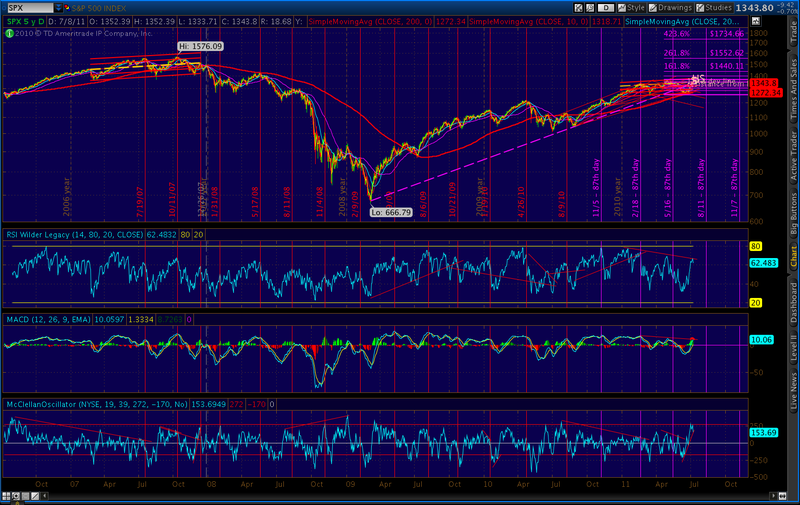 At its current level of 275, it's an indication of a strong upside move or, more likely, a very overbought condition. As the graph shows, this is a relatively high reading. 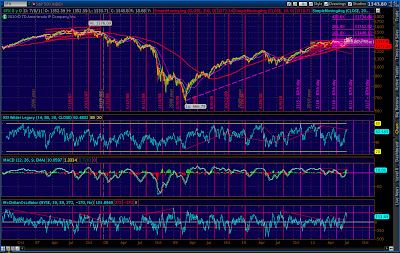 In 2007, the oscillator spiked up to 233 on the final high of that topping pattern. This spike followed a long and then a short downward-sloping, divergent move from previous highs. The same pattern has developed in today's market. It got me to thinking about expectations. What were we all thinking on December 10, 2007; and, how does that compare to today? I've assembled a handful of links for market commentary from a few days before until a few days after that important day. The market had made a strong move up, and bulls were out in force -- even in the face of increasingly disturbing economic news. But, a key Fed discount rate announcement was expected on the 11th. The market hoped for a .50% rate cut, but got .25% instead. The DJIA shed 300 points, and the SPX nearly 40. Obviously, we have issues that loom at least as large as 2007's right here in 2011. Instead of a rate cut, we're waiting on news of a deficit ceiling increase -- so we can borrow trillions more to keep the economy afloat. Instead of WAMU, we're worried about Greece, Ireland, Portugal and maybe even Italy failing. I could go on, but I encourage you to take the time to skim through them yourself, paying particular attention to expectations and sentiment. It's very instructive reading. Thanks for the great analysis. I agree with this interpretation of the McO. The only thing this market had/has to do is burn off the very extreme equity PCR of mid June.